From the back cover: Trying to escape form his Texas Baptist Upbringing and a troubles past, Christ Kerry came to Salt Lake City to get an education–and nothing else. But keeping his promise to stay away from the Mormons proves difficult, especially with two cute college girls living across the hall. And when Chris finds a new job at a tuxedo shop, his promise unravels as he discovers new friendships, hidden secrets and a lost heritage he never imagined he had. The Rogue Shop illuminates how we recognize truth even in the most trying of circumstances. 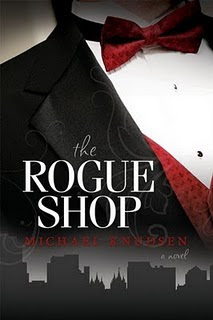 Michael Knudsen’s hilarious debut will remind you about the value of faith, family, and friends as Chris learns from his past to move forward into a better future. This book was finished several days ago and it continues to resonate deeply within me. What I got from it was not at all expected: real pure lasting peace and a warm feeling of hope. The Rogue Shop stole my heart and expanded my love for fiction. The main character Chris comes full circle from being orphaned by a drunk driver living with his aunt to a young man finding his way in the world and seeking for truth. His past is not perfect, in fact he has some giant ghosts in his closet. But in his dreams he is offered a tiny glimpse of eternity and the parents he lost at such a young age. Bound and determined to make it on his own he heads to the University of Utah to stake his claim on the world…alone and penniless. When he takes a job at the local tuxedo shop and an apartment downtown he has no idea how drastically his life is about to change. Michael Knudsen’s characters are brilliant, even down to the small seemingly insignificant landlord. I felt I knew each of them personally. His historical downtown Salt Lake was a charming, almost lost world of ZCMI stores and 50’s ball gowns. I think the back story of The Rogue Shop resonated with me because I grew up in a part member family, split between two religious beliefs. And the Washington DC temple he uses as an anchor in his plot was the closest to our little army base in Maryland. But, most of all I will remember the lasting impression Chris’s conversion left for me. What a solid, wonderful debut for Michael Knudsen. Thanks to him sending me a copy of his book. The redemptive message of The Rogue Shop has the power to change, to uplift and to comfort. If you are in Utah stop by for The Rogue Shop – A Book Release Celebration. Monday, December 13 th 2010 from 6-9pm Open House at 500 E. 8680 S. Sandy, Utah.